An ecological or biodiversity enhancement is an action that improves biodiversity and ecological habitat in the local environment. Enhancements should increase opportunities for local biodiversity and go beyond normal business practice or predetermined planning and construction conditions. Building hard structures is essential in some locations for flood protection and erosion control at the coast. Structures such as walls, jetties and pontoons are also needed for valuable port and harbour activities. These structures and their associated maintenance activities can have ecological impacts, both positive and negative, temporary and prolonged. In many cases, hard structures are poor ecological surrogates for the natural shoreline often supporting few dominant, opportunistic species. In addition to changing the type of substratum available for colonisation structures also influence the surrounding environment by altering the wave climate and modifying sedimentation. These broader ecological considerations need to be considered in wider ecological assessments undertaken as part of any new scheme and in replacement of existing structures. Environmental impacts need to be considered during planning, design, construction, maintenance and operation of coastal structures. This is difficult because construction will always involve some disturbance of habitats and changes in the physical characteristics of the environment. Designing and testing ways to improve the ecological value of structures where they have to be built is therefore a research priority. A particular challenge is integrating the idea of ‘ecological enhancement’ in the design and planning process, from conception through to construction. To aid with this process the Environment Agency have produced a guidance document that discusses the idea of ‘ecological enhancement’ of hard coastal structures and how it can be imbedded in the design and planning process, from conception through to construction. The guidance examines the opportunities, benefits and policy drivers for incorporating ecological enhancements where hard coastal structures are being considered, examines entry points for incorporating these considerations in the planning process, and outlines which stakeholders need to be involved at each stage. In 2017, Glasgow University published 'Greening the Grey: A Framework for Integrated Green Grey Infrastructure (IGGI)'. Appendix 4 of this document makes the 'Business Case for Coastal and Estuarine Integrated Green Grey Infrastructure (IGGI)'. Artecology, based on the Isle of Wight, designs ecological enhancements and bioreceptive installations, delivering proven gains for habitats, species and coastal communities. CIEEM (2018) Guidelines for Ecological Impact Assessment in the UK and Ireland: Terrestrial, Freshwater, Coastal and Marine. Chartered Institute of Ecology and Environmental Management, Winchester. Ecological enhancement techniques to improve habitat heterogeneity on coastal defence structures. - Estuarine, Coastal and Shelf Science. Volume 210, 15 October 2018, Pages 68-78. Artecology ecological enhancement projects on the Isle of Wight. CIEEM (2016) UK principles on good practice to achieve Biodiversity Net Gain. Guidelines on Ecological Designs and Management of Urban Habitats (Disused Docks). Ecostructure - aims to produce stakeholder-focused tools and resources, designed to raise awareness and facilitate uptake of opportunities to employ coastal eco-engineering solutions to climate change adaptation. 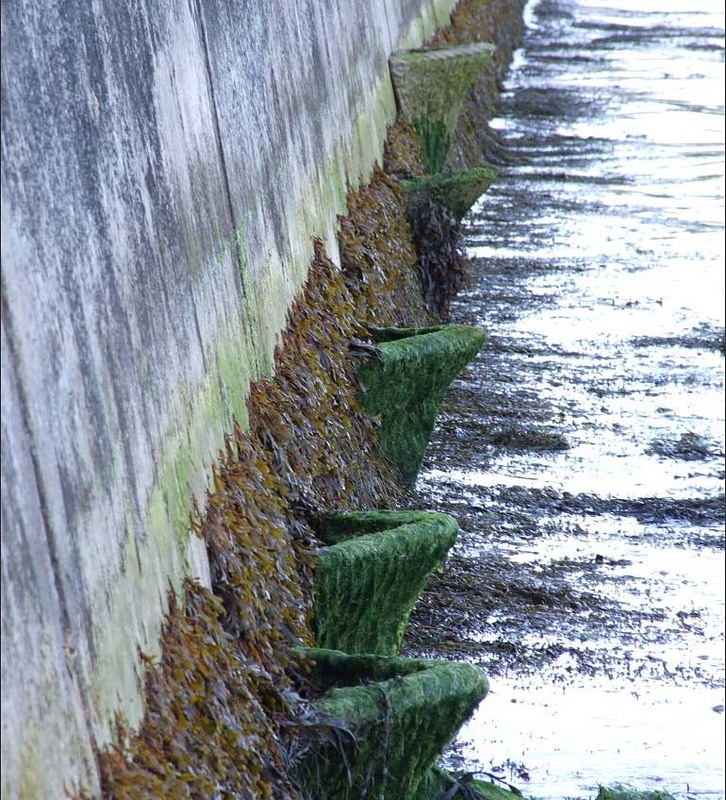 Blue is the new green – Ecological enhancement of concrete based coastal and marine infrastructure - Article in the Journal of Ecological Engineering, 2015. Estuary Edges - Thames Estuary Partnership project on replacing concrete riverbanks with natural habitats. Greening the Grey: A Framework for Integrated Green Grey Infrastructure (IGGI). This report from Glasgow University presents innovations from academia and practice designed to green grey infrastructure assets such as bridges, street furniture and coastal engineering structures that need to remain primarily grey for their essential function. ECOncrete® - concrete products designed for enhancing the biological and ecological value of coastal and marine infrastructure.